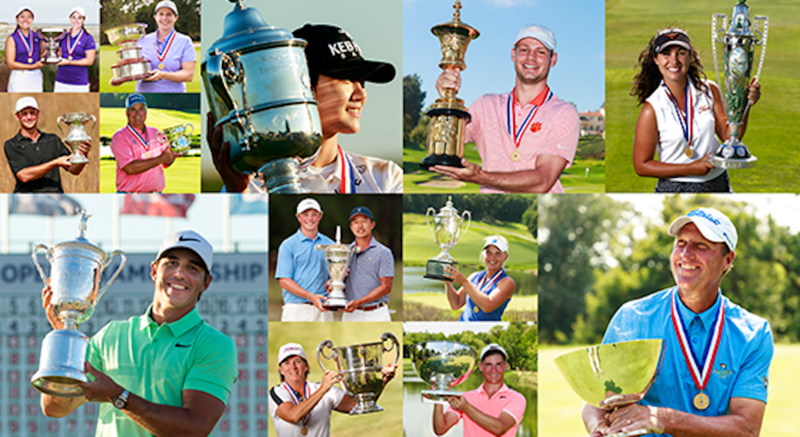 15 USGA champions with 15 amazing journeys competed in the Celebration of Champions at Shinnecock Hills Golf Club prior to the 2017 U.S Open Championship. Call it the win that keeps on giving. When Sean Knapp won the U.S. Senior Amateur last August in his first national senior event, he knew there would be perks that went with that title. Things like a 10-year exemption into the U.S. Senior Amateur, two-year exemption into the U.S. Amateur, three years into the U.S. Mid-Am and two years into the U.S. Senior Open. What he didn’t know – because it hadn’t been announced when he won – was that he would become part of U.S. Open week at Shinnecock Hills, even he wasn’t playing in the Open. The Celebration of Champions debuted Tuesday, a four-hole alternate-shot exhibition honoring the winners of the 2017 USGA Championships. Two-person teams competed in the fun event and then attended a special dinner that evening in the historic Shinnecock Hills clubhouse. The Champions event started at 4:30 and he and partner Noah Goodwin, the reigning U.S. Junior Amateur champion, had a tough go of it, making a triple-bogey on the first hole. But it wasn’t about score necessarily, rather putting on a show for the crowds that followed the groups as well as the national television audience. Jack Nicklaus was the official starter and greeted and watched each player as they hit their opening shots. Among the competitors was Kenny Perry, the reigning U.S. Senior Open champion. After dinner, Knapp set out for a trip west that would eventually finish in Johnstown. But after being on the road for a half-hour, it was realized his clubs hadn’t been joined his luggage in the trunk and a U-turn was made to retrieve them and start again. A brief stop in Bloomsburg for a three or four-hour rest that passed as overnight then gave way to another few hours to Sunnehanna Country Club for the first round of the Sunnehanna Amateur. A two-hour delay to the start of the first round gave him an opportunity for a bit of extra rest.